In the past, parents were advised to seek dental care for their child by the third or fourth birthday. Unfortunately, we now know that for many children, this is too late. Children who develop Early Childhood Caries, an aggressive form of tooth decay that begins in infancy, will have significant damage to their teeth even by 18 months of age. If these children don’t receive dental care until they are preschoolers, they will experience pain, infection, and tooth damage that can require complicated treatment. Local pediatric dentists treat over 50 children a month between the ages of two and five years in an operating room setting where multiple baby teeth have to receive nerve treatment, steel crowns, or, even worse, be removed. “A case treated by UAB Department of Pediatric Dentistry involved a 28-month-old where 16 of the 20 baby teeth had to be treated—12 of which had to be removed,” says Dr. Stephen Mitchell of the UAB School of Dentistry. The primary cause of this child’s dental disease was chocolate milk. Fortunately, Early Childhood Caries is a preventable disease, and pediatric dentistry focuses on teaching parents how to prevent it by establishing practical, dental-friendly behaviors from the beginning of life. Below are five simple suggestions that can lead to a child having excellent dental health. The American Academy of Pediatric Dentistry recommends children have a well-baby dental exam by their first birthday. The goal of the exam is to prevent dental disease before it has a chance to start. 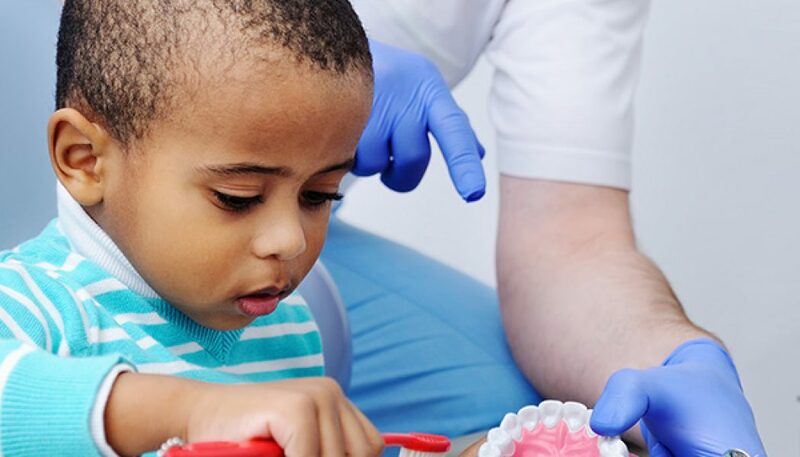 The dentist will examine the child’s mouth as they sit in the parent’s lap and provide important information about caring for the child’s mouth. Sugar should only be given one time a day and never between meals. Sugary drinks (juices or sodas) cause more cavities at this age than anything else. And, the evidence is growing that these sugars also harm children’s growing bodies. Pediatricians recommend no more than 4 to 6 ounces of sweet drinks in a day; pediatric dentists add that it is best to give this at a single mealtime. Avoid using drinks and food as pacifiers. Give formula or breast milk at scheduled feeding times, and give water between meals. And remember, even 100% natural juice has no nutritional value. View it as a high calorie, sweet tasting treat. It can be great for a special treat, but should not be part of a child’s daily diet. Never put a child to bed with any liquid other than water. Sweet drinks at sleep time cause rapid tooth decay. Some liquid medications actually contain sugar to improve the taste that can damage a child’s teeth. Give a child water to drink after taking liquid medications to rinse the syrup off his or her teeth. Gentle brushing of all surfaces of the teeth and gums just once a day will effectively keep them clean. Bath time is a good time to clean a child’s teeth. Use a soft-bristled toothbrush. Do not use toothpaste, infants will swallow it, and swallowing too much fluoride can damage the developing permanent teeth (a condition called fluorosis). The dentist will explain how to use toothpaste after your baby’s first birthday. Children will want to chew on the toothbrush. Chewing will not harm anything and may actually help him or her develop good oral hygiene habits. Just remember that chewing on the brush does not clean the teeth. They need to brushed also. Children continue to teethe. By 12 months, infants often have four upper front teeth and four lower front teeth, though children get teeth at different rates. If a child does not have these particular teeth by his or her first birthday, there is no reason for concern. The dentist can explain the teething process at the child’s first dental visit. To help relieve a child’s teething discomfort, give him or her a cold teething ring, frozen washcloth, or teething biscuits. Falls and tumbles are part of a child’s normal development as he or she learns to walk, and they could lead to mouth injuries. Do not leave a bottle or sippy cup unattended in a child’s mouth because it can cause a more serious injury during a fall. Coffee tables and raised fireplace hearths can create trip hazards. Consider placing a soft blanket or throw over them while a child is learning their balance. If a child’s mouth is bleeding from a fall, apply gentle pressure to the wound with a clean cloth. Contact the dentist if the bleeding persists. Remember that bleeding in the mouth mixes with saliva, making the amount of blood look greater than it actually is. If a tooth has been loosened or moved from its normal location during a fall, contact the dentist immediately. If the tooth is broken or out of the mouth, try to bring the tooth and/or its pieces to the dentist’s office. Baby teeth cannot be put back into the mouth, but it is important for the child that all the pieces are accounted for. Dr. Stephen C. Mitchell currently serves as director of the UAB Sparks Dental Clinic, which focuses on developmentally and cognitively delayed/ autistic children.